This door seal must be ordered with the appropriate accessory pack shown in the related items failure to add this may result in the order being refused, cancelled or you having to place an additional order as the relevant accessory pack will be supplied with this door gasket from factory as it has been determined by Liebherr that it is required to allow fitting. Do note that fridge and freezer door seals where you are replacing one that has been foamed into a formed door can be difficult, even for experienced engineers and that we would recommend that you allow lots or time and patience in order to fit many of these types of door seal. Please ask about suitability of this door seal to fit your model of fridge, freezer or fridge freezer if you are unsure as, although many look the same they are in fact different. You can do this by sending a simple query to spares@ukwhitegoods.co.uk or by using our contact and enquiry page from the links below for this or any other spare part. 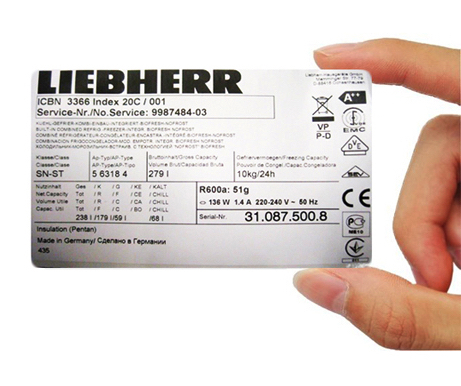 For Liebherr spares please give us the full model number and service number from the rating plate, normally found inside the fridge on the left hand wall so that we can quickly assist you. Without that service number it may not be possible to locate the spare part you require. This is really essential in making sure that you get the correct spare parts for your Liebherr fridge or freezer and is required to look up spare parts for you. The service number is found on the rating plate of your fridge, in the fridge section on the fridge freezer or inside your freezer and normally, in all cases, will be at the bottom on the left hand side wall. In a fridge, it is often the case that you will have to remove the salad drawer to find the rating plate. Without that information it is very unlikely that we will be able to locate the correct spare parts for your Liebherr product. Please note the delivery times for Liebherr spares as many parts have to come directly from factory in Germany and can take some time to arrive. Whilst we give an indication of delivery times these are variable and can alter. If you have urgent need then please contact us and we will try to advice as best we can but, with factory orders from any manufacturer information is almost always extremely limited and can alter. Liebherr is a top quality German manufacturer of refrigeration products for both domestic and commercial use and, we love them. If you are thinking of buying a new fridge, freezer or fridge freezer then, in our opinion, you can't get much better than Liebherr if you can at all. You can also find much more out about Liebherr from this article if you need more information about the company. The range is vast and spans many, many years so there are quite literally hundreds of variants of each cabinet so, proper identification of spares is absolutely essential and, in order to do that for you, we need the service number. Most spare parts for Liebherr where in stock are dispatched within 24-48 hours and spare parts that need to come from factory take around a week to two weeks generally but please do allow some latitude there. If you need more accurate dispatch times please ask and we will try to advise as best possible.